Fuchsia, color named after the beautiful flower, consists of pinkish, reddish and purple sub-tones. I don't think there is a girl who is not fond of this vibrant and vivid color! Pretty and romantic, yet strong enough to boost your confidence (especially if you're not a fan of red color). 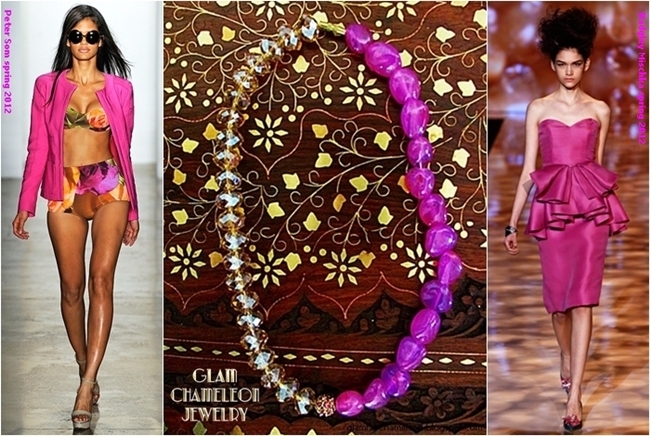 Flirty, seductive, enchanting, energetic color... simply magnetically charming! I'm devoting this post and collages to all glamorous and fabulous ladies who enjoy their lives day by day and aren't afraid to show their exquisite personalities! Fuksija, boja nazvana po istoimenom prelepom cvetu, sadrzi u sebi rozikaste, crvenkaste i ljubicaste tonove. Ne verujem da postoji devojka koja nije naklonjena ovoj zivahnoj boji. Lepa i romanticna, ipak dovoljno jaka da vam podigne samopouzdanje (pogotovo ako niste pristalica crvene boje). Boja koja navodi na flert, zavodi, ocarava, energizuje... jednostavno magnetski sarmantna! Posvecujem ovaj post i kolaze svim glamuroznim i fabuloznim damama koje uzivaju u svom zivotu dan za danom, i koje se ne plase da pokazu svoju izuzetnu licnost! Fucsia: nice colour and perfect for the spring! Such a sweet and girly color! I can never have enough! love this pop of color!! happy sunday! what a nice color! love the dresses! I love the colour, and fuschia is definitely a statement in itself! I'd like a pair of silk pants, ankle length in this shade! I am having a love affair with fuchsia right now. It's a beautiful color on everyone! This is my ultimate Favorite color ever....!!! Is so girly and chic just love it. I love fuchsia and agree - it is lovely! I love fuchsia and I love those first home photos, very inspirational. love fuchsia and love this post!!! 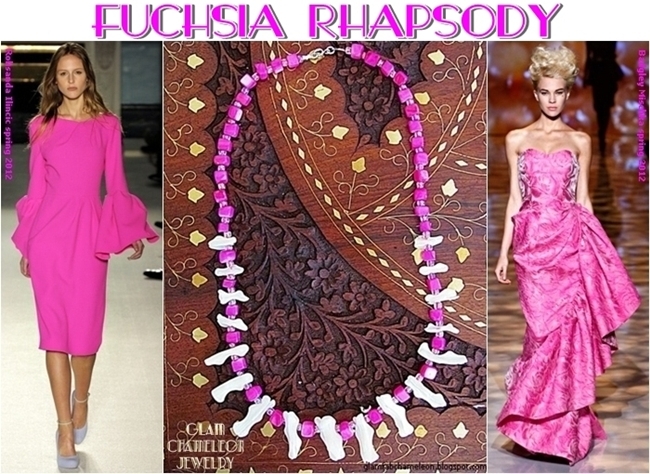 Great blog post, I love fuchsia! 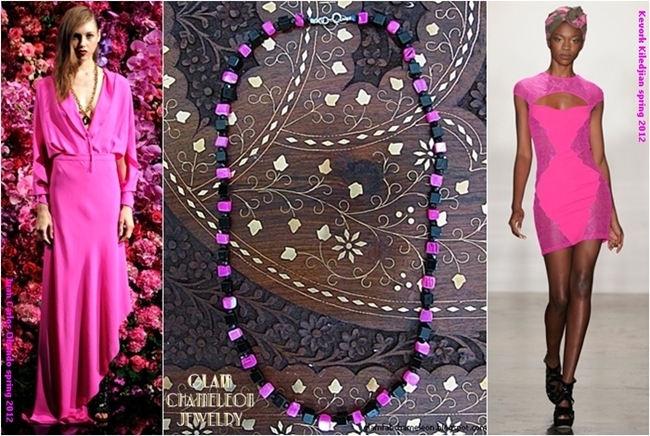 Fuchsia is one amazing color and it's perfect for the spring time. Hi honey, hope you had a wonderful weekend! Thanks so much for doing a whole post on my favourite colour. I am in pink heaven here! I want/need/love everything you've featured. one of my fav colours!! minogue and shayk are beautiful!! such a fab color! 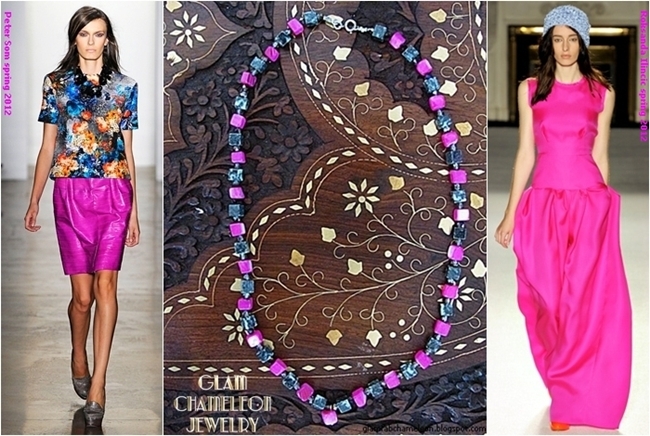 my favorite piece of yours is the necklace that is half clear crystal and half fuchsia! that is hot. love the necklace, so cute!!! This is a color that I love, and certainly one of the women there! I love it! It's a great color especially for spring and summer. i love the room inspiration!